Got damaged hair that breaks and splits easily? You'll need these deep conditioners in your corner. 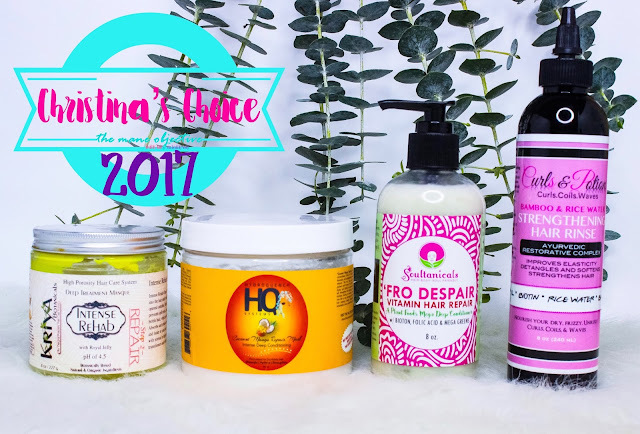 Every year, the category for Best Deep Conditioners for Natural Hair gets harder and harder. As new brands come on the scene, and brands that I've been rocking with release new products, my ability to narrow down the best of the best begins to wither away. Some picks were no-brainers, and others were a close call. But in the end, I promised myself that no more than 4 deep conditioners in each category could reign supreme, and the Deserted Island Pick must go to one of each only. And if your hair is hella dry? You'll need these babies, too. The Nourish & Hydrate Deep Conditioning Masque is literally everything. The consistency, fragrance, and performance reminds me of what would happen if Soultanicals Afrotastic and Mielle Organics Babassu Mint got together and made a deep conditioning baby dripped in moisturized, minty goodness. The Nourish & Hydrate Masque is thick, rich, has crazy slip, makes my scalp tingle, and leaves my hair feeling baby smooth after rinsing. Packed with grape seed, avocado, silk amino acids, aloe vera, basil and more - Nourish & Hydrate is EVERYTHING for maintaining a moisture balance in the hair and feeding the scalp. 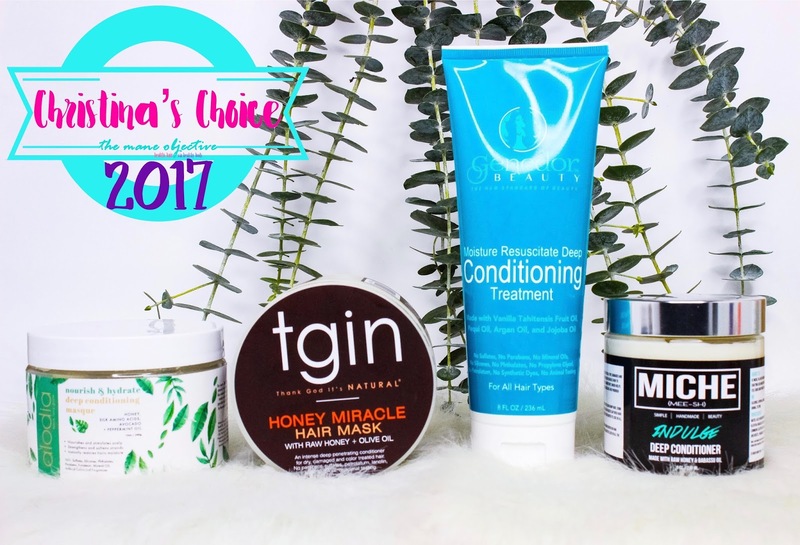 I don't think Honey Miracle Hair Mask will not never be on this list. It's one deep conditioner that I've seen naturalistas of all textures and types flock to - not only does it smell amazing and feel super creamy, it's loaded with honey, olive, and jojoba oils - providing a decadently moisturizing punch while making the hair feel super smooth and shiny. And the slip? Off the chain. 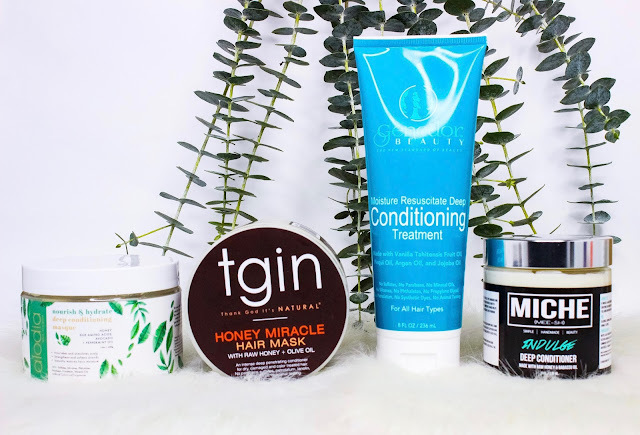 I can't get enough of Honey Miracle Hair Mask - From heat damage, to healthy, to color damage, recovery, and the road back - Honey Miracle Hair Mask has seen it all. And performed beautifully in each scenario. No matter what condition your hair is currently in - Honey Miracle Hair Mask will work it out for sure! I told y'all there was more Genedor Beauty to come! The Moisture Resuscitate Deep Conditioning Treatment most certainly lives up to the name. Packed with an amazing assortment of moisturizers and humectants - from aloe vera and honey to Tahitian vanilla and mango butter, this deep treatment hydrates, nourishes, and leaves hair supple and buttery smooth. Not to mention, it's packed with slip - making product distribution and removing tangles easy breezy. Don't believe me? Just watch...the video. Trust me - you're gonna wanna put this one in your rotation ASAP! INDULGE is the brainchild of beauty YouTuber Michelle B.//Everything Mich and burst onto the natural haircare scene back in 2016 in a real way. It's thick, rich, full of mega moisturizers like aloe, castor oil, babassu oil, and honey - while maintaining an intense amount of slip that will make any naturalista happy to have wash day. The fragrance is a dream, and it makes my curls feel smoooooth as buttah. INDULGE Deep Conditioner is a knockout offering from Michelle, and I love the idea of supporting a content creator branching off into full-blown entrepreneurship. Because my hair can't ever just be one thing (one texture, one porosity, one length, one color), I tend to appreciate products that appeal to both the high and low porosity ends of the hair spectrum. , which is formulated for normal and high porosity hair. After my first time using the Intense Rehab Deep Treatment Masque, I IMMEDIATELY sent Claire a DM and thanked her profusely. Not just for making products that contain strawberry, papaya, and royal jelly, but for including ingredients like turmeric banana, and hemp, which are proven to help scalp conditions like psoriasis. Y'all, my hair and scalp felt SO good after deep conditioning. I wish I could bathe in it. I just need y'all to know this jar is empty - those yellow remnants are there just to make the photo look like something. It's time for me to re-up. It seems like every year, I drop a bomb or two on you guys! I put up a product you've never seen me review or talk about in depth. Don't worry - that time is coming for HydroQuench systems. While playing in an assortment of their products during the later half of 2017, I fell madly in love with the Coconut Mango Repair Mask. It's one of the fluffiest deep conditioners I've ever encountered. It's intensely moisturizing, but leaves my hair feeling soft, smooth, and strong. 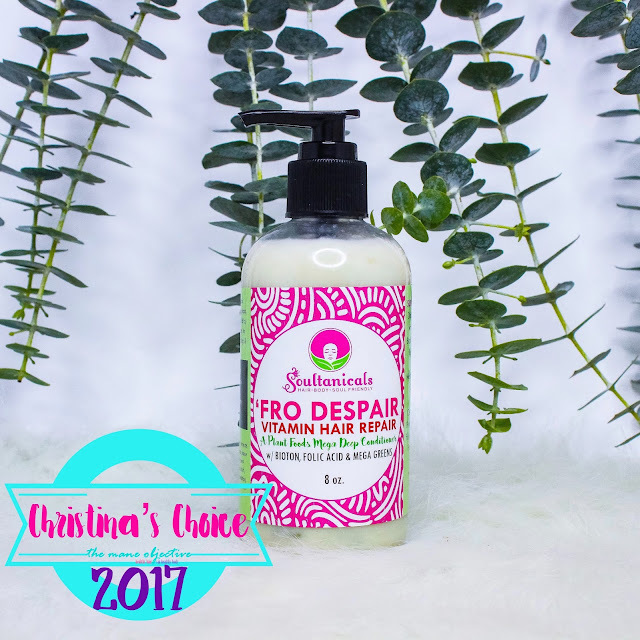 It's got great slip, and because it's not ridiculously thick, it penetrates easily into the low porosity sections of my hair. If you're in search of a strengthening mask that will make your curls pop (but also be protein free), this is the one for you my dear! Y'ALL KNEW THIS WAS GOING TO HAPPEN. I told you back in this review that 'Fro Despair is is literally peak deep conditioning. Seriously, 'Fro Despair is life giving. It's literally like a green juice shot for your hair and scalp. I am completely, utterly, and hopelessly obsessed with 'Fro Despair Vitamin Hair Repair. It's rich, creamy, packed full of stellar ingredients, and has ridiculous amounts of slip. Every time I use it, I feel like I'm feeding my hair and scalp. But the real win is how ah-MAY-zing my hair feels after I rinse. Soft, baby smoove, like buttah, and STRONG. Soultanicals has definitely cornered the market on moisture and strength with 'Fro Despair. I know, I know... Curls & Potions Bamboo & Rice Water Strengthening Hair Rinse isn't a true deep conditioner. Technically, it goes underneath your favorite deep conditioner to enhance it, but it can also be used as a standalone treatment. I couldn't put it in any other category though, so it's here - and deservedly so. Curls & Potions literally changed the game for me on wash day. Like, I'm in 2038 with it. Forget mixing oils into your deep conditioner, that wave is over. Bamboo & Rice Water Strengthening Hair Rinse is where it's at. And baaaaaaaaby let me tell YOU something! It makes my hair so soft, shiny, strong, and really helps my curls pop. I've also found that my scalp feels less dry. Trust me - if you've got length goals for 2018, you need the Bamboo & Rice Water Strengthening Hair Rinse in ya life, post haste. You guys already know there's two picks in this category - one moisturizing deep conditioner, and one strengthening. A 2017 newcomer and already the heavyweight champ! Congratulations to Alodia Hair Care! I'm telling you, this Nourish & Hydrate Deep Conditioning Masque is NOTHING to be trifled with. 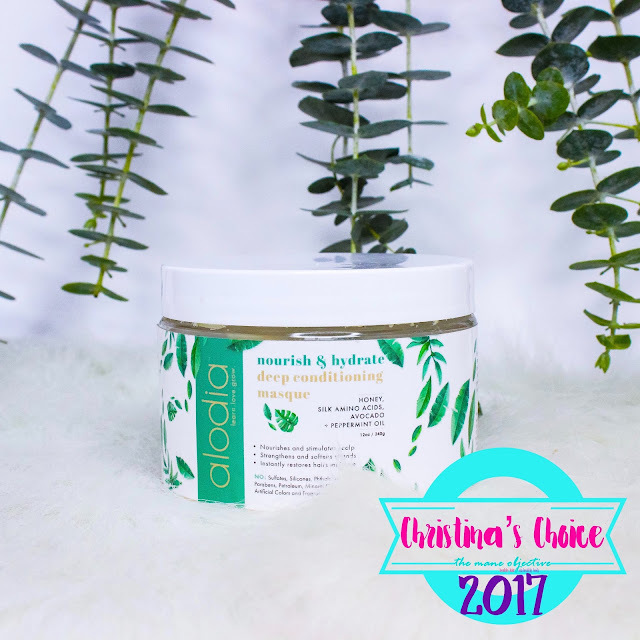 If healthy, moisturized hair and a healthy scalp is on your menu this year, you definitely want to give Alodia a lil' bit of your time. And coins. Get your weekly dose of greens. Did I really have to say it? I obsessed over this product from the moment it was released. I purchased the salon size, the regular size, and guard it with my life. 'Fro Despair is bae in the strengthening realm, and that says a LOT. I didn't think Ayo could top Afrotastic, but she did! I have read your post that is full of information. Thankyou so muh for sharing this useful information with us.